A Midsummer Night's Dream auditions. On Wednesday 27 March 2019 at the dlr Mill Theatre Studio from 8pm to 9:30pm, director Karen Carleton will hold the next auditions for 'A Midsummer Night's Dream'. The audition scenes for Puck, The Court and The Fairy Kingdom (all except Mechanicals), i.e. 9 roles will be available for everybody together with a draft rehearsal schedule. Please come along if you are interested in acting, playing a role backstage, or as part of the crew that will help put the show together for its outdoor performances in the grounds of St Enda's Park, Rathfarnham this summer. 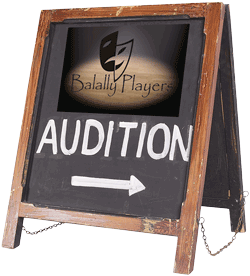 The auditions are open to Balally Players members. New members welcome. Applications for the scholarships, setting out a brief explanation of how you think you would benefit from the Scholarship, should be submitted to the Committee Secretary, Doris Cullen at dor.cullen @ hotmail.com by 5pm on Tuesday 2 April 2019. A decision, based purely on the submissions, will be made very shortly afterwards by the Committee and that decision will be final. It will be the responsibility of the persons awarded the scholarships to book their own places on the Summer School. Note: Only currently fully paid-up members of Balally Players may apply. The funny side of Shakespeare explored. The 2019 Convention of the Drama League of Ireland will be held in O’Loughlin’s Hotel, Portlaoise on Sunday 31 March from 2pm to 5pm. See Convention flyer. Registration is at 1:30pm. All Members are asked to join the meeting for the reports on the past year and to help plan for the future. Further to the changes made at EGM 2009, the DLI requires positions to be filled on the Board of Directors for the coming year. Nominations for places should reach the DLI on or before Friday 8 March 2019. Nomination form for Chair. Nomination form for Board. Motions for Convention, which may be submitted by the Board, member groups, sub-committees or a unit of five individual members, should also reach the DLI on or before Friday 8 March 2019. Motions and completed nomination forms should be sent, by 8 March 2019, to: Eugene O’Sullivan, Tullig, Coachford, Co Cork. A summary of the main group activities that are planned for the next six months and a record of the previous six months. Most of the events and activities organised by the group are listed in the Calendar of Events. To keep up to date, and transfer the details into your own diary, keep an eye on the calendar, which is updated each month. The categories of entries in the calendar include Performances and Member Events. For some of the bigger shows, if the production team chooses to use the calendar, it will also include dates for rehearsals. For more useful places to visit on the Internet, including maps for rehearsal venues, see the Links page. 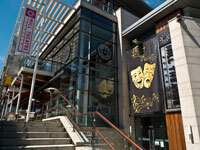 In return for access to the facilities at the dlr Mill Theatre for specified periods each year, the amateur drama groups in the areas around Dundrum provide volunteer support for Front of House. Several members of Balally Players give some of their time each month. To share the workload as evenly as possible, there is a need for volunteers to admit the audience and show them to their seats, if necessary. If you can give one evening each month to help at the theatre (from 7:20pm), please contact the Manager (Kate Canning) through the dlr Mill Theatre office on 01-296 9340. Keeping our growing programme and group alive and well requires the modest subscription associated with membership. It also covers the insurance that each member must have before they can be permitted to participate in staged events. For details on ways to pay your Membership Fee, see this summary of Payment Options in a PDF file which you can download. In addition to a record of all current, paid-up members of the group (maintained by the Treasurer), Balally Players also manages a Mailing List using the services of MailChimp.com Members of the general public can subscribe or unsubscribe using the 'Join Our Mailing List' option on the Home or Contact pages. The mailing list is used to distribute emails either to Members only, or also to anyone who wishes to hear about forthcoming productions and other topics related to the group's activities and interests. It is also used to send SMS text messages to Members and sometimes to anyone who has taken the option to include their mobile phone number. All Members should ensure that their current email address and their mobile phone number are on the list. You can check and/or change your contact details by using the 'Join Our Mailing List' option. You should also notify the Treasurer of any change to your contact details. This search facility will find references to plays, people or anything else within the pages of this website. It's great for searching past performances, newsletters or text within PDF files anywhere on our website. You may also use Google to find items, but it may not include recent entries if they were posted since the last time that Google scanned and indexed the site. A calendar showing key dates such as group Performances and Member Events is kept up to date monthly throughout the active period of the year (Sept to June). It may also have details on some rehearsals and other events. For a complete list of all group performances and links to more information on some, visit the Productions section. Copies of newsletters sent to Members in the past are stored in the Newsletter Archive. The files are in PDF format with additional text versions of some of the newsletters. Photographs taken at some productions and events are stored on the SmugMug.com site, some of which can be downloaded in various sizes. To see all of the available galleries of images, visit www.balally.smugmug.com For a guide to getting copies of the pictures, follow the link below to a PDF document about SmugMug with an illustrated set of instructions about Downloading Photos. Follow this link to the Balally Players YouTube Channel. The video produced as part of the 30th Anniversary celebrations in June 2013 is located there.